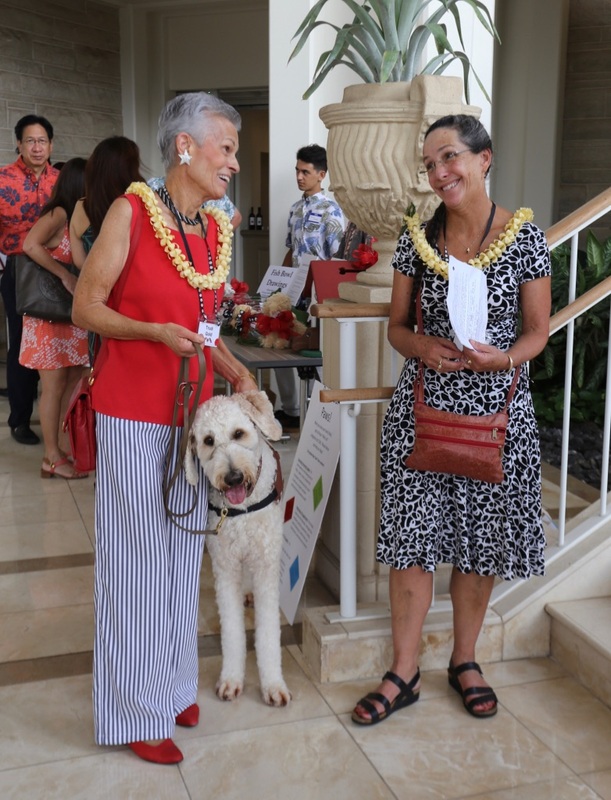 We have three different opportunities to spread Aloha this holidays and it all benefits Hawaii Fi-Do Service Dogs! 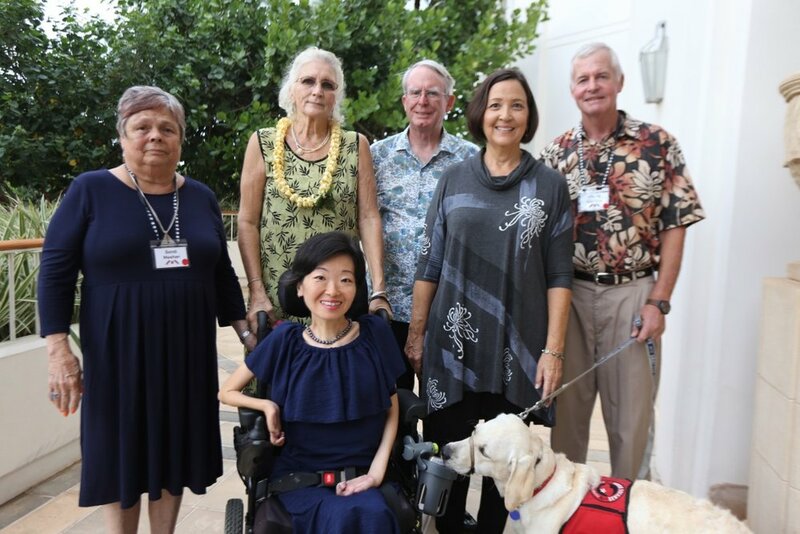 Hawaii Fi-Do Service Dogs is excited to announce that it has again been approved as a participating charity with “Aloha for Hawaii Charities”, a program of “Friends of Hawaii Charities.” Every dollar donated for our benefit, through their program, between November 15, 2018 and January 15, 2019, will be paid to Hawaii Fi-Do Service Dogs …. plus Fi-Do will receive a partial match from them. The partial match, whatever the eventual amount, can add up to be substantial. 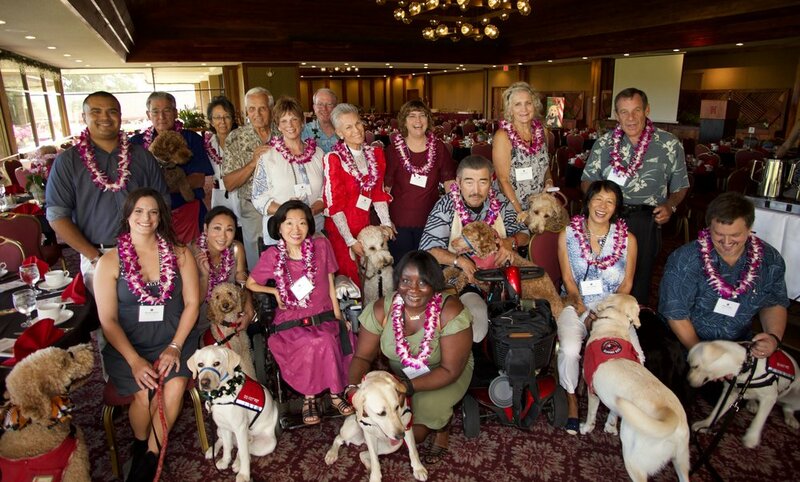 Be sure to click on Hawaii Fi-Do Service Dogs on the page with the “Pick a Charity” tab. Just in time for this holiday season! 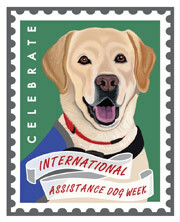 Hawaii Fi-Do Service Dogs is very pleased to announce a fundraising partnership with California Pizza Kitchen (CPK)! You can take advantage of their holiday special! Buy $100 in gift cards and get a $20 gift card back — as well as giving back to us!!! And, what can also possibly be a better stocking stuffer?!?! You can purchase cards which they will send out within a week or so, or purchase e-gift cards and get them online within 24 hours. 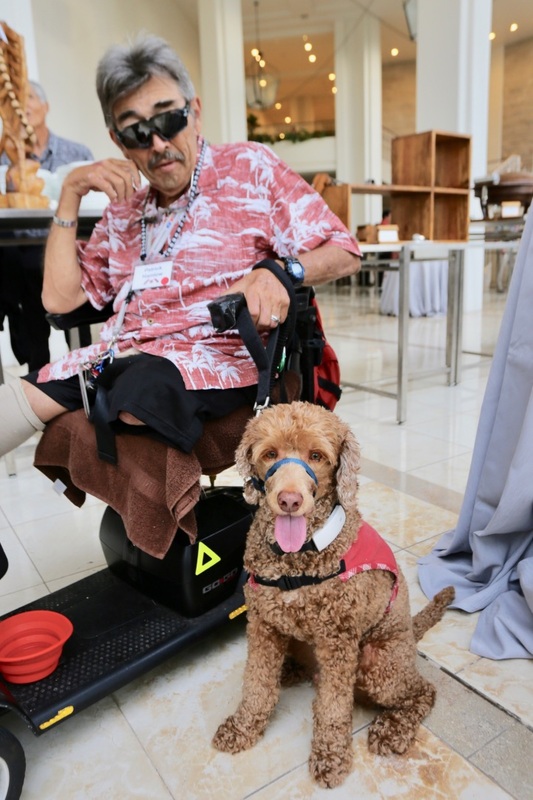 Your support helps Hawaii Fi-Do carry out its mission: providing well-trained, legitimate service dogs, without charge, to people here in Hawaii with disabilities other than blindness! Everything in our shop is 50% off. Use the code: ENDOFYEAR to get the discount. Sizes and styles are limited. 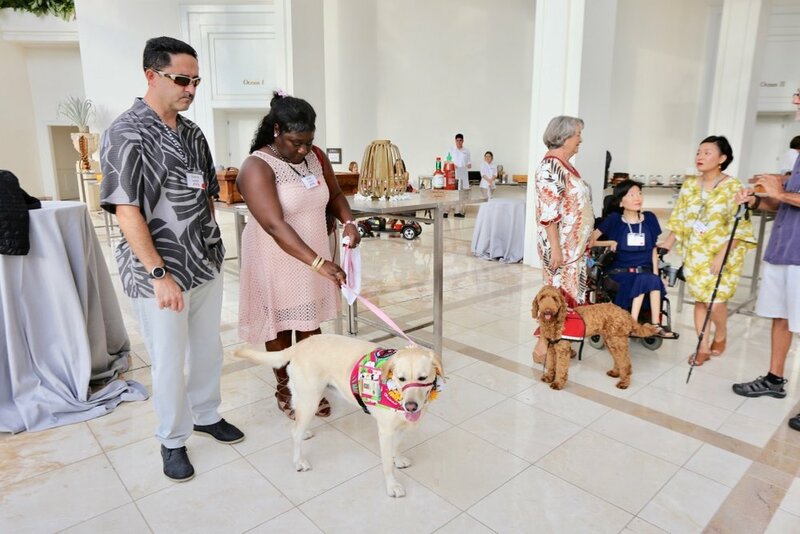 Hawaii Fi-Do Service Dogs held its 4th Dining with Dogs fundraiser at the beautiful Four Seasons resort at Ko Olina. Thanks to our donors, supporters, volunteers and friends who took part. 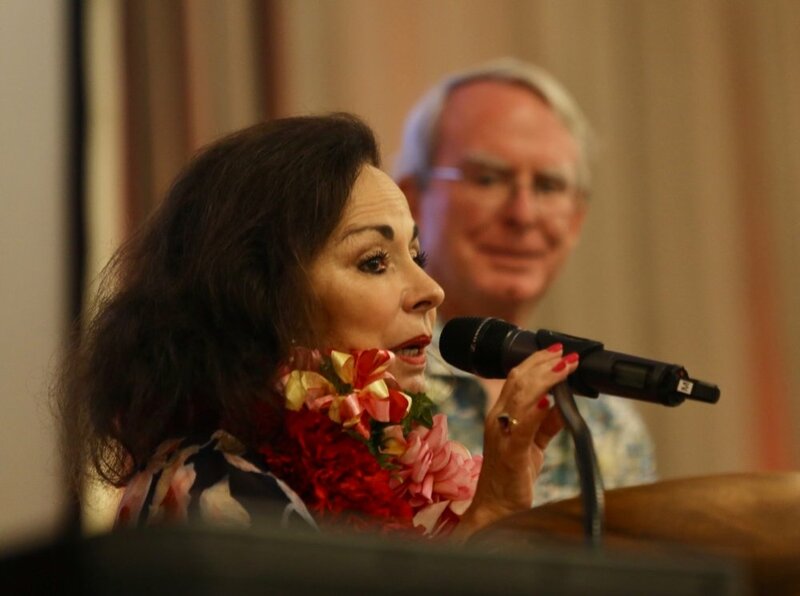 We honored philanthropist and great friend Myrna Murdoch, and long-time trainer and Fi-Do stalwart Trudi Gold! This week something extremely important happened here in Hawaii. 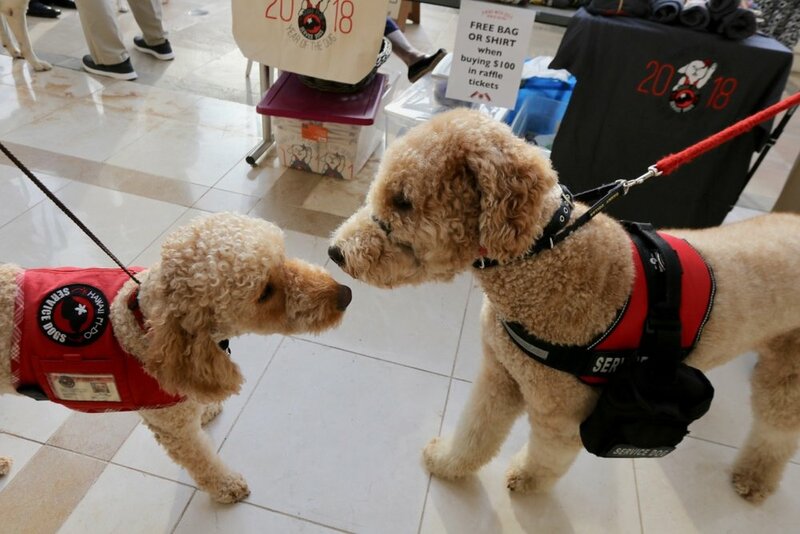 The “Fake Service Dog” bill (SB 2461 CD1) quietly became law! It’s effective date is January 1, 2019. 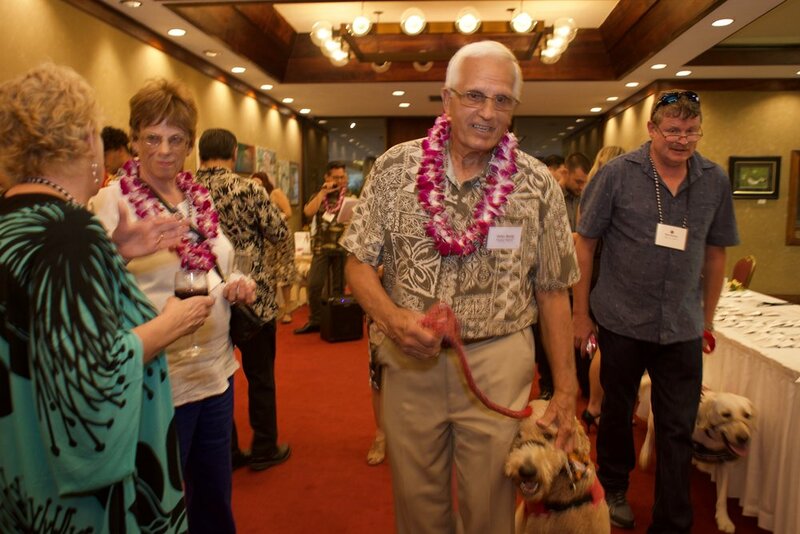 This would make it a civil violation when one poses their pet as a service dog when it is not and make Hawaii one of the states that recognizes that people faking their pets as service dogs. This is wonderful for the protection and respect of legitimate service dog teams. 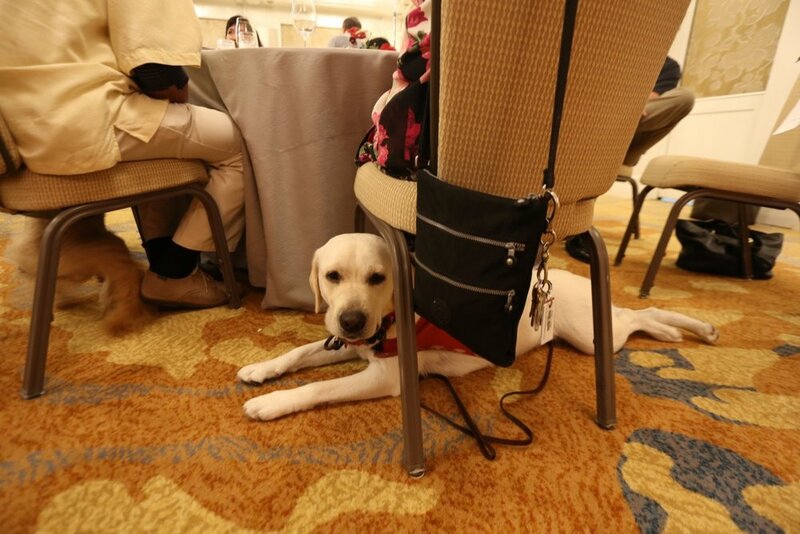 Now the real work must begin to help educate about what a service dog really is and understanding the real intention behind the ADA law that requires service dog access accommodations for those with disabilities. This would not have been possible without the help of a lot of people! Sen. Ruderman, the bill sponsor. 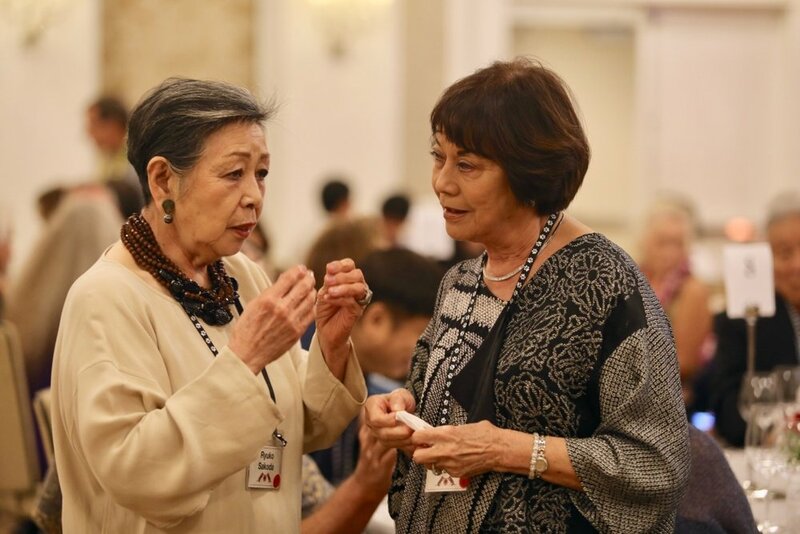 Rep. Nishimoto and Sen. Taniguchi who worked hard to come to a compromise in their Conference Committee. There were many other legislators and legislative aids who also helped behind the scenes. 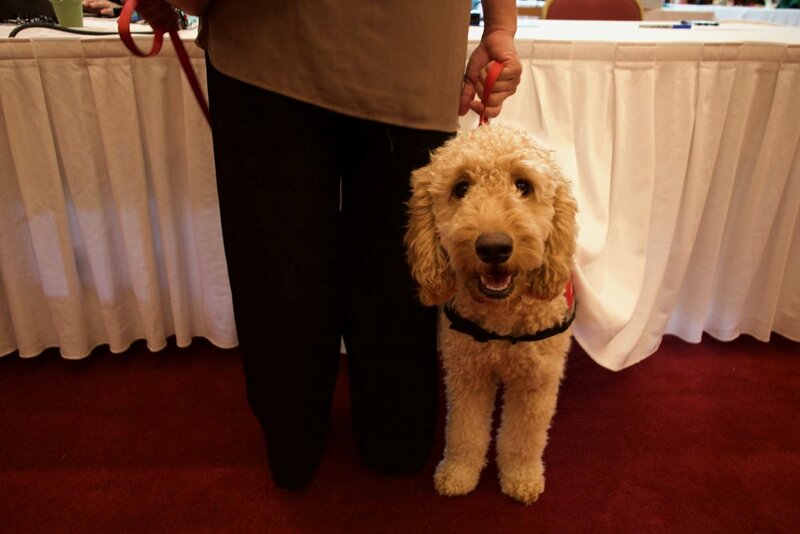 But as importantly, there were all the service dog teams and puppy raisers who faithfully showed up for legislative committee hearings to voice and show their support. You wrote letters, sent emails and some of you were even able to testify before our legislature’s hearing committees. In a very real way, YOU helped make this happen!! 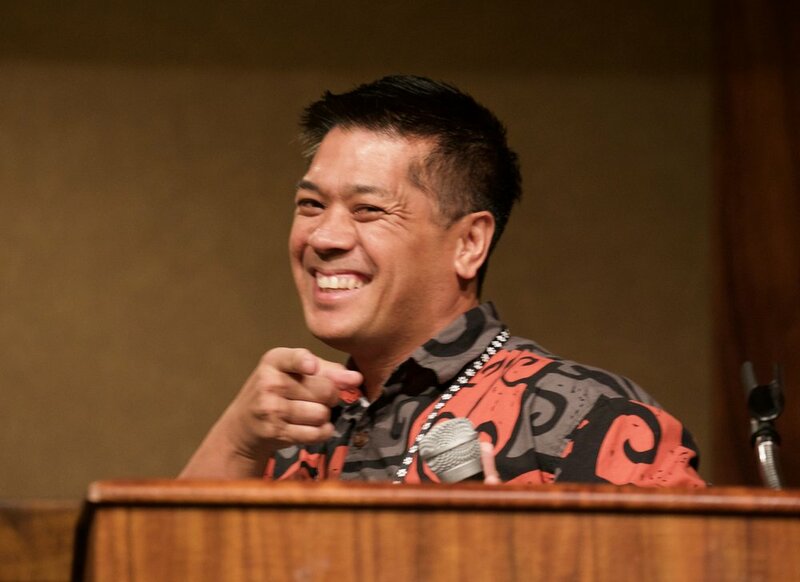 Huge mahalos to all of you!! 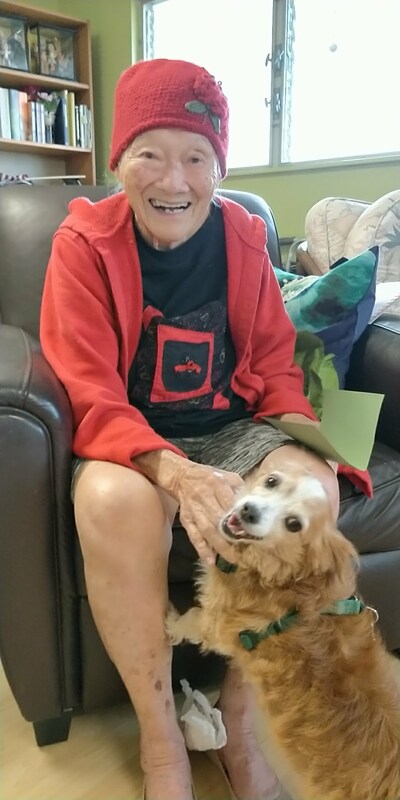 Esther Ikemoto, 94, or “Popo” as she was lovingly called, cherished all creatures great and small and she wanted for her love of animals to continue for future generations. 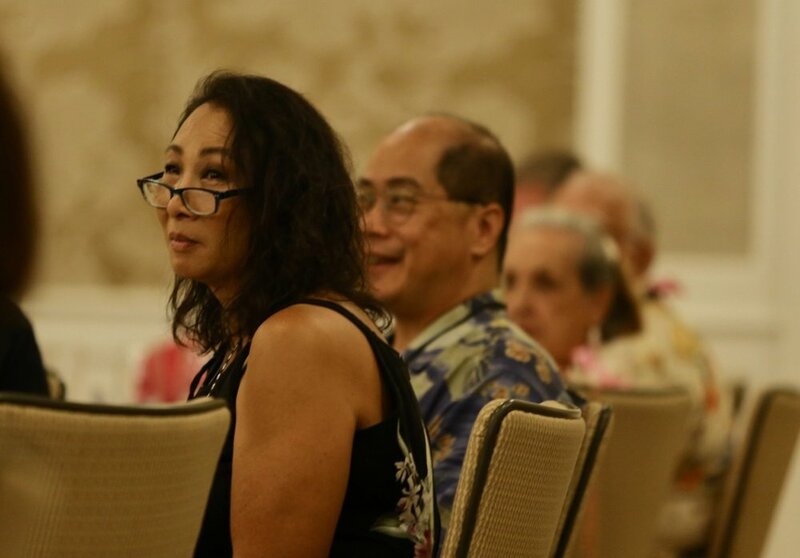 Her family wanted to fulfill their mother’s wishes so they created a legacy fund called "Popo Esther Love" at Hawaii Fi-Do Service Dogs, which has raised over $7,000. The Ikemoto family grew up with dogs. They had five rescue dogs: Rin Tin Tin, Trixie, Missy, Tanya, and Alvin. They ranged from mixed breed to poodles. Popo didn’t have dogs during her later years in life but cherished her children’s dogs. 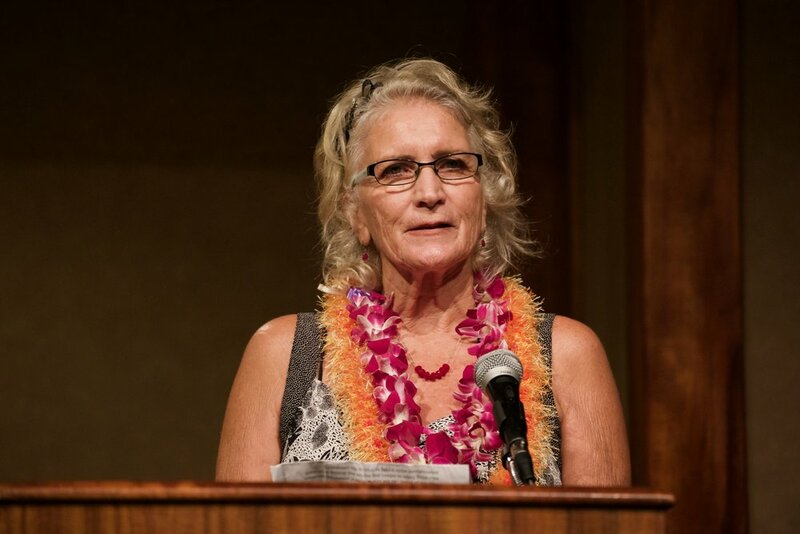 One of the reasons her family chose Hawai’i Fi-Do to create their mother’s legacy fund is the community outreach we do through our READ program. One of Popo’s daughters is a teacher at Waikiki Elementary School and one of Hawaii Fi-Do’s teams was there, having kids read to our dogs. The other reason is that we do outreach to businesses and the public to educate people about legitimate service dogs. Popo, your memory will always be remembered through every service dog we train and life they touch. 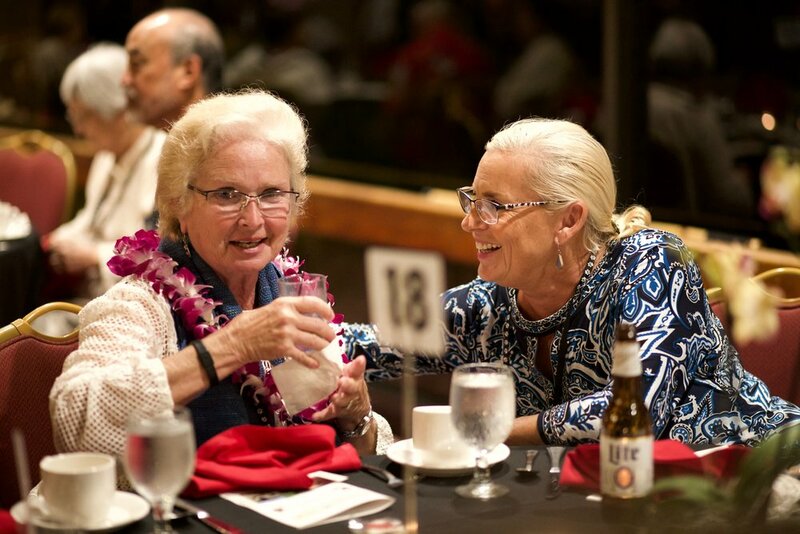 If you’re interested in honoring a family member or friend by creating a legacy fund, please contact us at info@hawaiifido.org. Get your sneakers and forks ready! 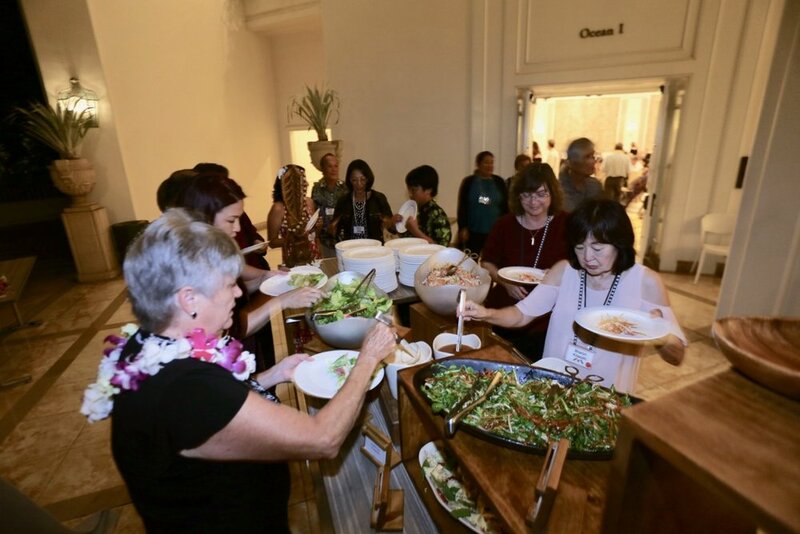 We are looking for hungry walkers to join our team at the 40th Hotel Industry Charity Walk in May on the Big Island and Oahu. Walkers are treated to food, drink and fun at checkpoints along the walk route. 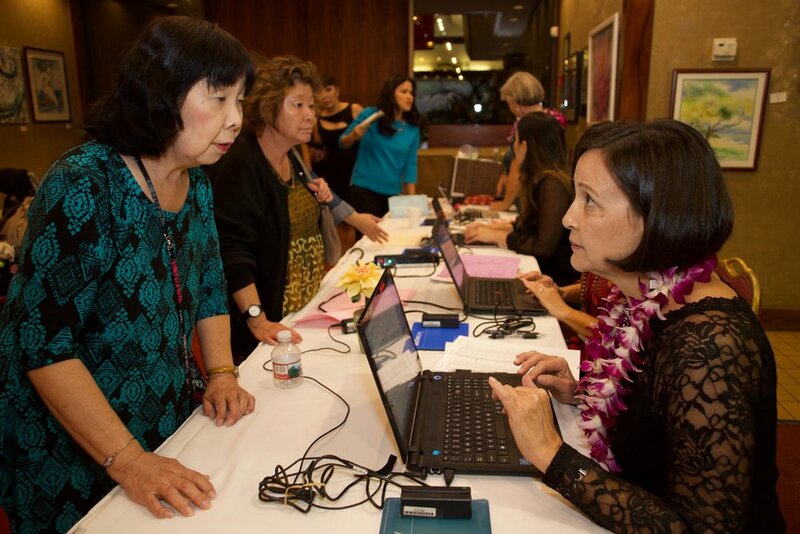 All checkpoints are operated and supplied with refreshments and helpers by Hawai‘i hotels and allied organizations. Entertainment may also be provided at many checkpoints and/or at the end of the walk. LIMITED TIME: Buy a shirt for $10! When you join our team or just want to donate, you can buy one of our “Paws Up for Service Dogs” t-shirt for $10 (normally $25). 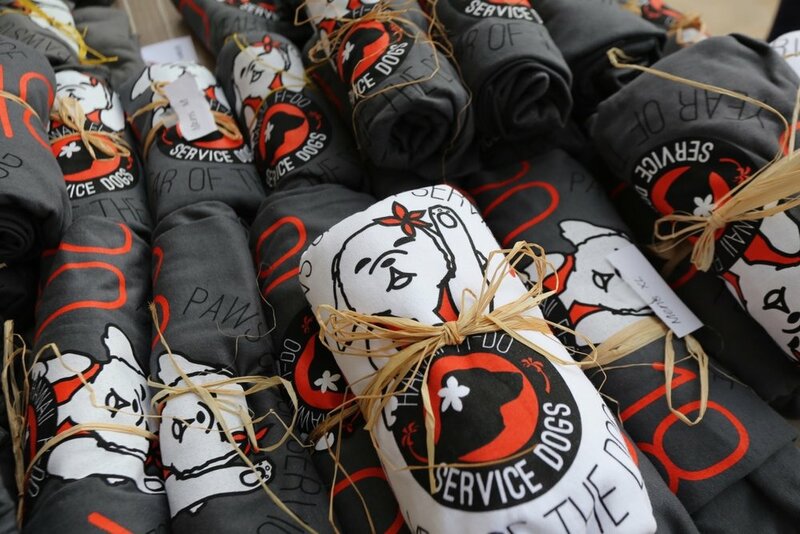 Year of the Dog “Paws Up for Service” t-shirt! We’re celebrating the new year with our Year of the Dog “Paws Up for Service” t-shirt! We are selling them for $25 in men’s (sizes M-XXL) and women’s (sizes S-XL) cut shirts. if you’ll like us to ship it, it’ll be $5 or free shipping for orders over $100. Please indicate what size and style you want. You can place your orders through our PayPal. Honolulu-born, LA-based graphic designer Summer Shigetani created this design. 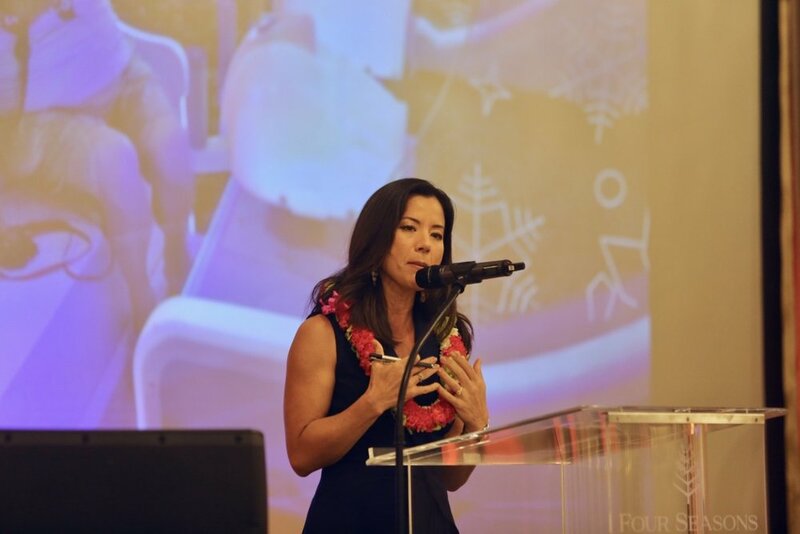 She was inspired by the Maneki-neko, a Japanese figurine that “waves” in good luck! Celebrate the Year of the Dog with us! You’ll have to wait another 12 years to celebrate again! All proceeds go to Hawaii Fi-Do. 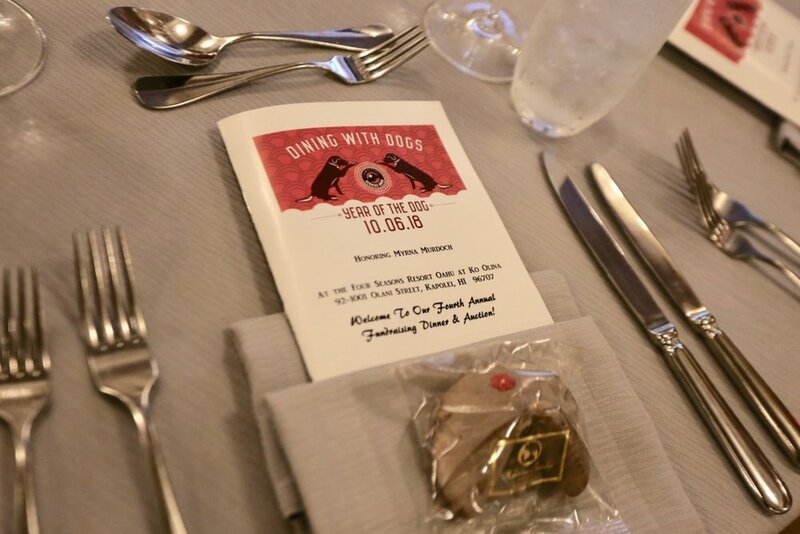 We had our 3rd annual “Dining with Dogs” fundraiser dinner and auction on Friday, October 20th, at the beautiful Honolulu Country Club. 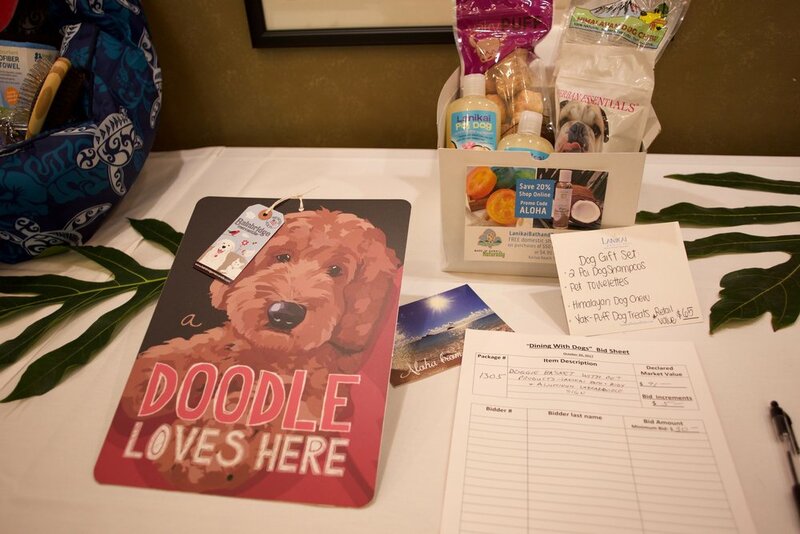 This year we were very happy to celebrate “A Night of Stars,” honoring our Fi-Do Stars: our dogs, our puppy raisers, our trainers and our graduates. 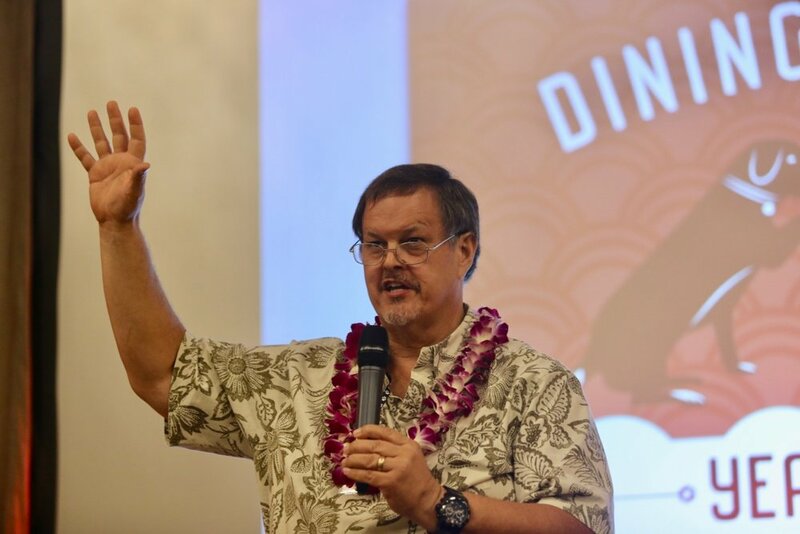 Before checking out at Foodland or Sack N Save, support Hawaii Fi-Do by donating to Give Aloha, Foodland’s Annual Community Matching Gifts Program, during the entire month of September. 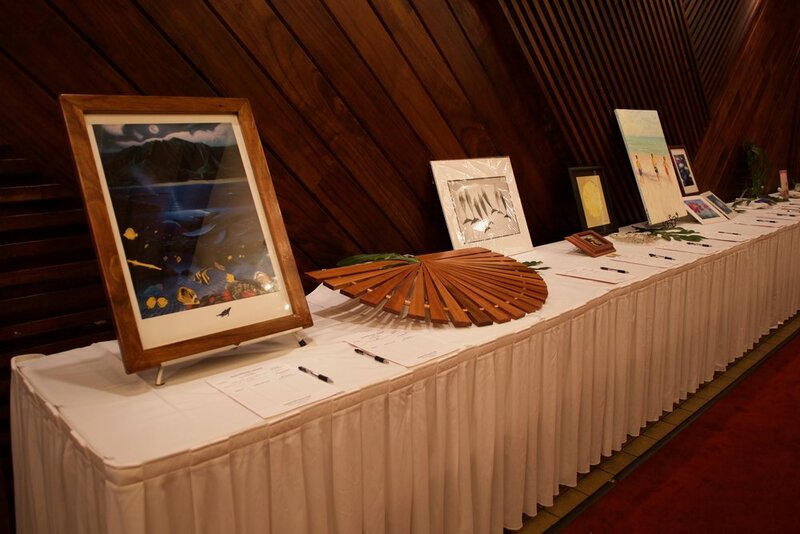 Customers are invited to make donations using their Maika‘i Card. Foodland and the Western Union Foundation will match a portion of each donation. 1. Show your Maika‘i card at checkout. 2. Give the participating organization’s 5-digit code number. 3. Tell the cashier how much you’d like to donate, up to $249 per organization. The amount will be added to your grocery purchases. Our five-digit registration code is 78117. 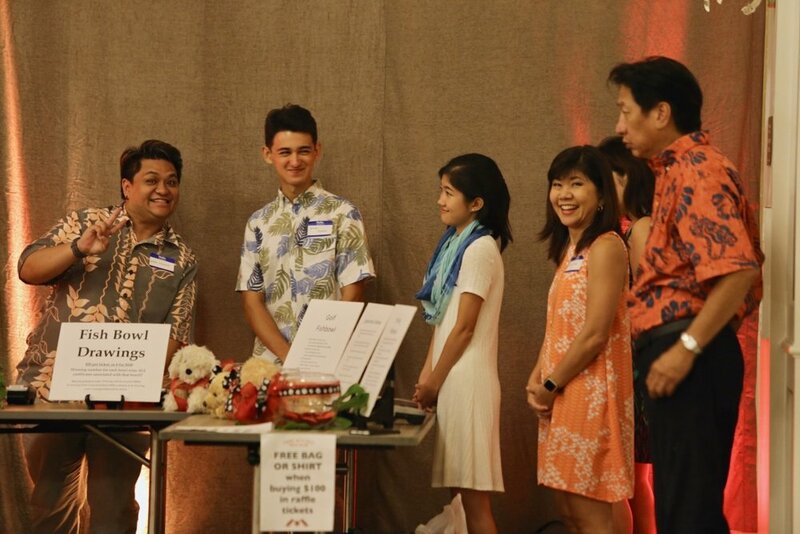 At checkout, present your Maika`i Card and inform the cashier that you would like to make a donation to our organization with our registration code. If you do not have a Maika‘i Card, you may request one. Your donation will be added to your grocery purchase total. You may give up to $249 per organization (donations exceeding $249 will not be matched). The amount you have donated to us and the name of our organization will appear on your receipt. Any donation must be made payable to Foodland or Sack N Save. Donor names will not be released to our organization, so if you would like us to know of your gift, please contact us directly so that we may properly acknowledge your gift. These contributions are tax deductible to the full extent of the law. Please save your store receipt for tax purposes since it will be the only record you will have of your donation. How Matching Gifts Will Be Calculated? Matching Gifts will be calculated after the end of the program. Organizations will receive 100 percent of all customer donations given to their organization, plus their percentage of Foodland's $325,000 matching gift. 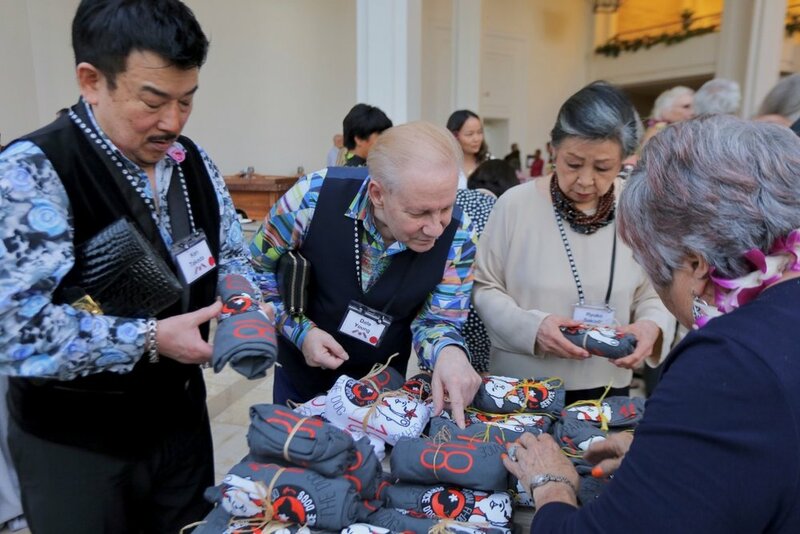 The portion of the matching gift that each organization will receive will be based on the total dollar amount of customer donations designated to that organization as a percentage of all customer donations received for all organizations.